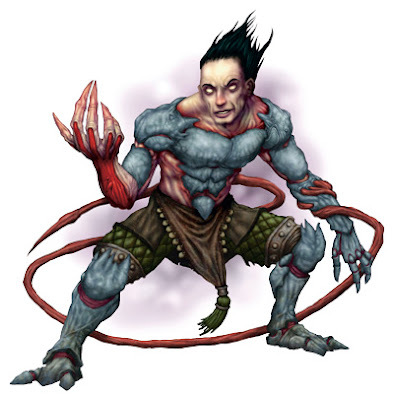 The World of Eberron faces no extraterrestrial menace so great as the Daelkyr! These alien beings may look uncanny and familiar, but they’re anything but. Fortunately, they’re sparsely seen. Those who have had contact with their home realm of Xoriat have ended up permanently mad, horribly mutilated, or warped by vile experiments. Among those experiments were the victims of the Daelkyr War; goblinoids and other such creatures that valiantly fought against these eldritch horrors. Those who failed were captured and mutated into unique horrors of their own. Countless hobgoblins, goblins, bugbears and more were destroyed beyond recognition. Their old identities were lost to history as their new horrid forms began to surface from dark depths and wicked wastes. Few understand the meanings behind these atrocities. Hit Points 44 (8d8 + 8); Speed 30ft. Vitality Drain. 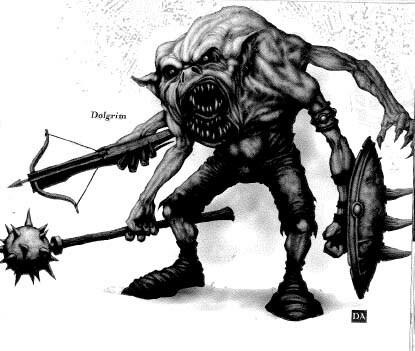 Every turn a creature is grappled by a Dolgaunt, their maximum hit points drop by 3( 1d4+2). Killing the Dolgaunt will return lost maximum HP to the victim. Tentacle Communication. Dolgaunts can silently communicate with either other within 30 ft. This method of communication cannot be observed unless their opponents also have blindsight. Multi-Attack. The Dolgaunt can use Tentacle attack twice. Tentacle. Melee Weapon Attack: +4 to hit, reach 10 ft., one target. Hit: 3 (1d4 + 2) bludgeoning damage. It can forgo damage to grab instead. Multiple Arms. Despite not being a true multiattack, the Dolgrim can attack with up to 3 off-hand attacks. It can use two of its “off-hands” to use a 2-handed weapon, if it desires. In addition, it gains advantage on Strength (Athletics) checks to climb as well as Strength checks to grapple. Dual-Minded. Dolgrim have two minds fused into one. They have advantage on all Intelligence, Wisdom, and Charisma saving throws against magic. Maul. Melee Weapon Attack: +4 to hit, reach 5 ft., one target. Hit: 5 (1d6 + 2) bludgeoning damage. Crossbow. Ranged Weapon Attack: +4 to hit, range 80f320 ft., one target. Hit: 5 (1d6 + 2) piercing damage. Dread Existence. Whenever a creature is hit by the Dolgrue’s claws, it must make a Constitution saving throw. If it fails, the creature takes an extra 1d6 psychic damage. Diehard. 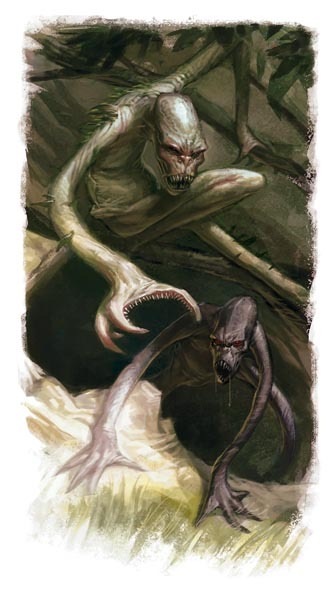 When initially dropped to 0 Hit Points, the Dolgrue instead follows dying rules as per PHB. Claws. Melee Weapon Attack: +7 to hit, reach 10 ft. , one target. Hit: 10 (2d4 + 5) slashing damage. It can declare grapple and forgo damage instead. Doing this still warrants the Dread Existence ability. Bite. Melee Weapon Attack: +4 to hit, reach 10 ft. , one target. Hit: 12 (2d6 + 5) piercing damage. Quickness. The Choker can take an extra action to move on its turn. Strangle. While the Choker grabs its victim, it cannot speak or use spells with verbal components. The victim is also restrained. Incredible Grappler. The Choker can grab creatures up to large size without penalty. Multiattack. The Choker can use Tentacle twice. Tentacle. Melee Weapon Attack: +5 to hit, reach 10 ft. , one target. Hit: 5 (1d4 + 3) bludgeoning damage. Hit creatures are also grappled (with a Dexterity Save DC of 13). Created by Doctor Necrotic for Doctor Necrotic Media. Property of Keith Baker and Wizards of the Coast. ← 5E Modern/5E Sci-Fi fans unite!